AFIRE Stylish fireplace, to innovate you must surprise ! How to reinvent a design fireplace with the luxury of the customization? The fire is no longer used by designers, architects or interior decorators. They are considered as too dangerous and with too many constraints. For creators the chimney flue is a very big issue. The installation of a pipe often makes the creation of an open-fire impossible or complicated, especially in urban areas. In addition, the user too must undertake a multitude of duties which, very often, can be very off-putting in the decision to have a fire. With the arrival of the new embedded constraint-free and flueless inserts, creators can discover infinite possibilities of concepts with fire. The stylish fireplace is no longer just an object of decoration, a vestige of the past but instead a functional design fireplace with remote control and electronic security systems that will take on new forms to merge, to sublimate or to be the essential element of a living area. Esthetics, creativity and freedom are the prerogatives of this modern, modular luxury fireplace which are naturally created by designers, interior decorators and architects. For designers, decorators, and architects, the pleasure of fire must be the driving force of the creation. The search for well-being in living spaces can take any shape or form of imagination. Fireplace designs can sublimate interior architecture projects, erasing the “motionless” side of decor to bring it alive. In light of globalisation and standardisation, the NEED to define your own territory become increasingly necessary. Creation has an essential role to play in this domain as usually the conceptions of luxury fireplaces are disappointing and mundane. But with the new embedded inserts, you will be able to appropriate this brand new fire designs. Now the designer is YOU. For both the creator and for the user, the fact of not having to install a chimney is a decisive step in the implementation of an open-fire. When using an ethanol insert, most of the installation involves preparation of the surround decor into which the fire space will be inserted. Ultimately, all that is required is planning the decor and ensuring a nearby power supply. Installation of the insert only usually takes a few minutes. 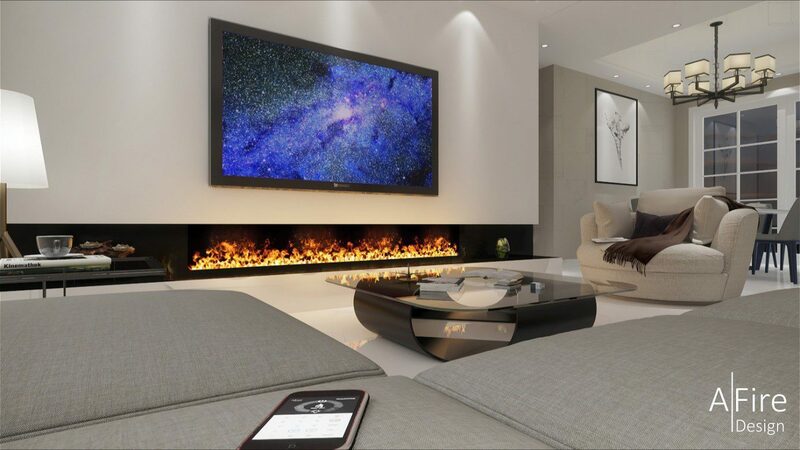 To create your high-end design fireplace, AFIRE has conceived a vast range of remote-controlled ethanol burners and 3D water vapor electric fireplace inserts. These inserts are secure, simple and comfortable “engines of fire”. Try one and see fire in a different light! Your modern and fashionable fire! How to create your luxury design fireplace which fits perfectly within a stylish interior?